So, now it being officially announced, weeks of expectations and thrill finally came to an end for Manchester United fans around the world as everything goes in United’s favor triggering football’s biggest transfer – Paul Pogba to Manchester United. The amount Manchester United paid for the move varied from source to source before the transfer but one thing was clear – WORLD RECORD. The highly reliable Di Marzio quoted a figure of £110m gross which includes other fees related to the transfer, so the net payment figure to Juventus by Manchester United will be a little over £100m as claimed by the Italian journalist. 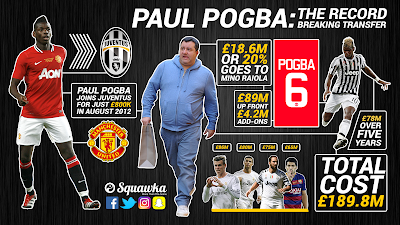 And agent Mino Raiola who secured the deals of Henrik Mkhitaryan and Zlatan Ibrahimović earlier in the window will be receiving a figure of £20m+ for Pogba’s move to his boyhood club. Once the transfer got finalized and was announced officially on August 7th, Juventus surprsingly quoted the transfer fee on the statement as €105m which is around £89m with the fee being paid over 2 financial years. The statement also mentioned there would be an increase in the fee by €5m (£4.6m) if certain conditions are achieved during the course of the contract. HAS MONEY SPOILED THE BEAUTIFUL GAME? One thing is very clear from the above words, there will be complaints made on every big transfer move claiming the transfer fee as absurd and the player is not worth that much but we are in the 21st century where football has changed a lot and it’s time we learnt to live with the change and move on or else will get left behind and there won’t be any surprises if this record fee gets broken within another year. 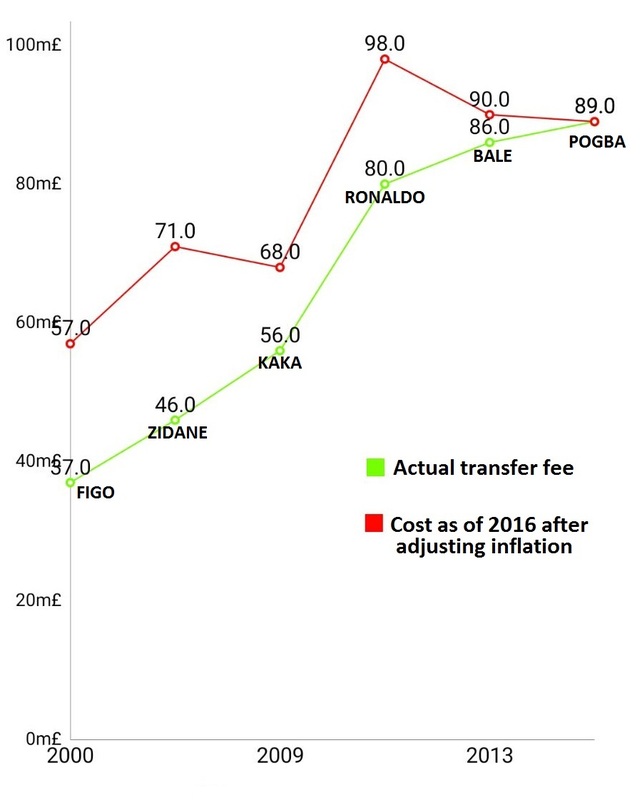 It can be learnt from the above graph that although a lot of money has been put into the game of late, inflation has played a more crucial role in the rise in transfer fees which football supporters around the world fail to take notice. Luis Figo’s controversial transfer is worth £57m now and Zidane would have cost Real Madrid £71m today which are very close to the figure of the current transfer record fee of £89m, a 23 year old Paul Pogba is not yet equal to the likes of the galacticos Zidane and Figo but that is where the extra money has been put in when the difference in the quality of the players are also considered, but let alone the transfer fee is looked upon, there is no significant difference to be seen. WILL ZLATAN‘S JERSEY SALES FUND POGBA’S MOVE? Few days back Zlatan posted a pic on Instagram along with Pogba with the caption reading “My shirt brought him back” and when Paul Pogba was linked to United heavily couple of weeks back for a 100m move, there was a strong rumour going around social media claiming Zlatan Ibrahimović’s shirt sales have made £76 million for the club in the first week thereby becoming a significant part of the payment for Pogba. But, how true is this? A look into the official numbers from the financial statements of the club for the past 3 years, it can be seen that the club sold around 2 million jerseys in the previous seasons with the average price of the jersey being £80. On an average it is presumed a football club of United’s stature gets 20 percent from the jersey sales and the major part of the rest goes to the kit manufacture. Applying the above logic, the club will make around £30m by way of jersey sales in a season and this includes jerseys bought with players name other Ibrahimovic, personalised names and jerseys without print. 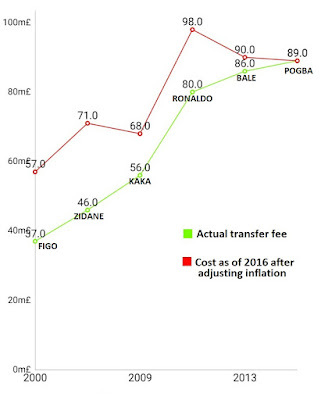 Thus, the internet’s bizarre claim of Zlatan’s jersey sales funding for Pogba is proven wrong. It is estimated that the Manchester United PLC will generate a £500m revenue for the calendar year 2016 after posting a record third quarter revenue of £123.4m. If the half-a-billion revenue is achieved by Ed Woodward & co, it would be a massive increase of 26% from £395m in 2015 and £70m more than previous record revenue which was achieved in 2014. Although the club’s revenue is not generated equitably throughout the year but if an average is to be considered, the revenue will be £1.4m/day. So, by the time Pogba was first linked to United on June 25 to the day he is expected to make his debut on August 19 against Southampton, Manchester United would have already generated revenue equivalent to the world record transfer fee. The Times went with a report stating Pogba’s signing will rope in £40m for the club in the first year alone through several sponsors with the commercial department of the club working on a marketing strategy to pair the midfielder with Zlatan Ibrahimovic for several promotions. The world record signing has also been a major boost for Manchester United’s kit sponsor Adidas with the German sports giant teasing the fans in some fashion, the French international signed a £30m personal deal with Adidas earlier during the year. And not to forget United have already signed EA Sports as official video games partner with Pogba leading the promotion pictures. 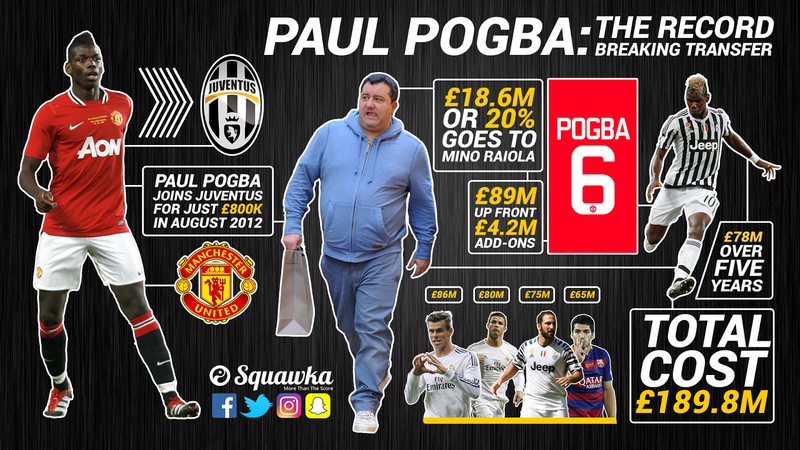 CAN POGBA BE WORTH THE HUGE SUM? There have been high profile transfer moves before where the player was worth every penny the club paid for him just like in the case of Cristiano Ronaldo and also there have been big money transfers which have failed miserably. Only time will tell whether or not Pogba can live up to the fee but it also depends upon whether he can pull his magic on a cold rainy night at Stoke against Joe Allen.